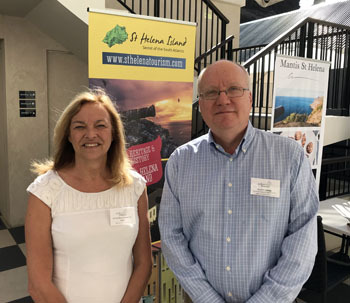 In March, Tristan's UK Representative Chris Carnegy travelled to St Helena for a series of meetings that shone a spotlight on the natural assets of the South Atlantic. 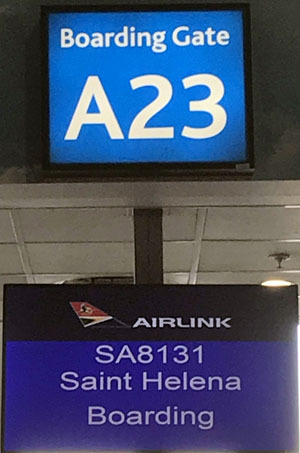 I'd been to St Helena on the RMS, but was intrigued to experience a flight to the new airport - and quite a flight it was. Leaving Johannesburg, we re-fuelled at Walvis Bay in Namibia, and all felt normal until the last phase of the approach. Then, with rocks already looming beside us, the aircraft sharply dropped towards the concrete, a result of the infamous 'wind shear'. Passengers gasped, the pilot applied full power, and we avoided a nasty thump by regaining enough lift to allow a landing on the further half of the runway. Pilots would call that a 'sporting' landing! 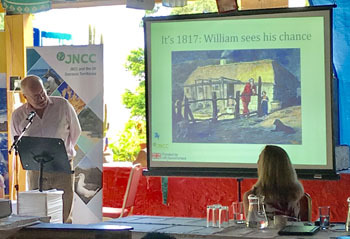 It was the concept of 'natural capital' that brought delegates from many parts of the world to St Helena. The idea is to ascribe a value to many aspects of nature, everything from fish to healthy walks in the countryside. The numbers can then aid decision-making; on building plans, allocation of public funds, conservation work and more. I was invited to chair the first morning, starting with an introduction for the Governor, HE Lisa Honan. Three days of discussions followed, and my report back to the island is brimming with contacts and ideas from the sessions – on topics as varied as tourism development and composting. 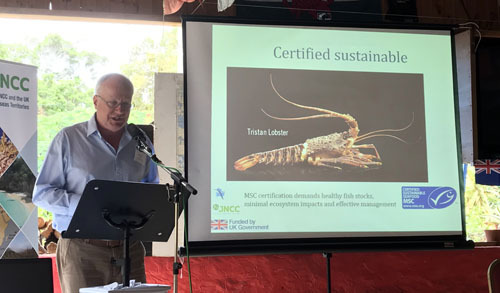 On behalf of Tristan's director of fisheries Cllr James Glass, who'd hoped to attend but had to relinquish his berth to Cape Town, I also gave two presentations. The first was a general introduction to Tristan da Cunha, while the second explored the importance of Tristan's existing fisheries to its economy and well-being. That talk brought admiring comments from St Helenians, impressed by the financial earnings for the island from a sustainable fishery and by the community joint effort involved. The conference marked the conclusion of a project that has ranged across all the UK south Atlantic territories. It will generate a comprehensive dossier about Tristan, with specific themes including development of the tourist trade, future fishing, and the risk of landslides. Alongside the main conference, I took part in a one-day workshop on the progress of the 'Blue Belt' marine-protection programme across the south Atlantic. 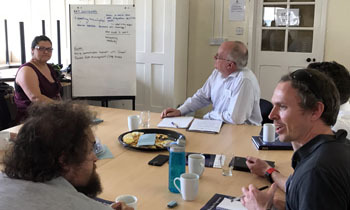 The UK's Marine Management Organisation was in town and it's an important time for Tristan: the incoming council will use expert evidence from MMO and others to decide what form of ocean protection is best. 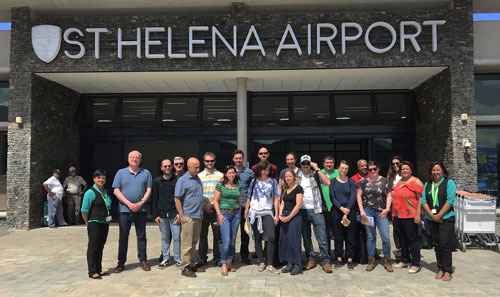 Delegates were left in no doubt; this challenge is different to that in St Helena or South Georgia, because Tristan already combines a permanent population, vital commercial fisheries, and a proud tradition of environmental stewardship. 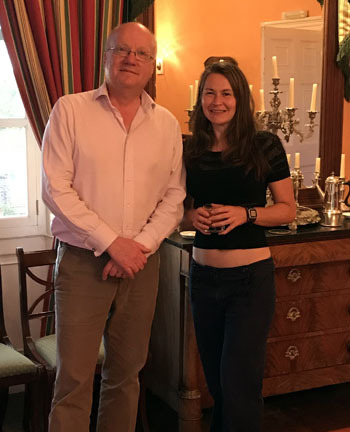 With Ascension Island Conservation Director Dee Baum at the Governor's Residence - Plantation House on 12th March. to the delegates on 12th March. Chris making a presentation about Tristan Fisheries on 13th March. Chris with members of the St Helena Legislative Council on 15th March. A further appointment was with members of St Helena's Legislative Council. We gathered in their Chamber in Jamestown's Castle and I offered greetings from Tristan and a briefing on issues of joint interest. The two islands will be making similar representations to the UK on long-term funding for the territories after Brexit. Developing our education and training links is a real possibility, especially with the prospect of flights from Cape Town to St Helena. And safeguarding our precious environments will always be a common priority. 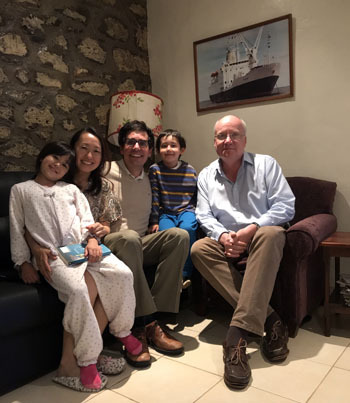 Left: Chris with Neil Foster and his family at their St Helena home on 13th March. This busy and stimulating week brought a host of useful ideas, and also renewed and strengthened links between islands that are joined as well as separated by the waters of the south Atlantic. Oh, and the take-off homewards was wonderfully smooth!